Moderate to difficult, some strenuous spots. 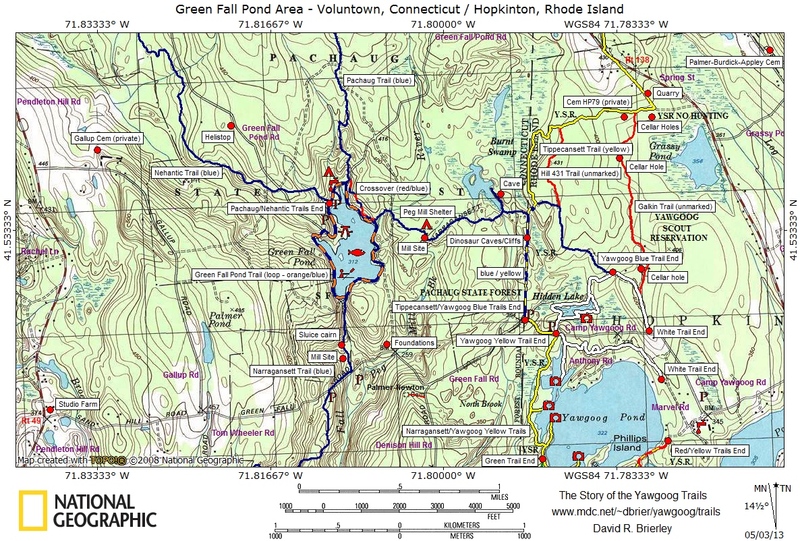 The southern end of the Tippecansett Trail starts at Beach Pond and ends 5 and a half miles south at the state line marker along Green Falls Road near Hidden Lake. The hike can be quite challenging at times especially at the beginning and the end. The trail is well blazed in yellow and, for the most part, easy to follow. The hike described here is a one way trail and a car spot is required. After leaving the small parking area on the south side of Route 165, we found ourselves traversing the eastern edge of Beach Pond. The trail has several small ups and downs and is quite root bound as it passes several boulders along the waters edge. Soon you will come to a large outcrop that juts out into the pond. This is a good spot for viewing the pond. The trail then continues as it starts to make its way around the southern edge of the pond. After crossing a small wooden bridge large ledges loom to the left. They are quite impressive among the forest of pines and hemlocks. Soon you will come to a trail intersection. Ahead is a sign and the white blazes of the Deep Pond Trail. To the left you will see a rock with the word “LOOKOUT” painted on it and a trail that leads to the Hemlock Ledges Overlook. (Well worth the climb if you have never been up there). For this hike, turn right here and continue to follow the yellow blazes of the Tippecansett Trail. The trail first descends back down towards the pond before turning away and heading westward. This stretch is rather rocky and slightly uphill almost in its entirety. The trail then comes to an old dirt road. Turn left here and follow the road passing the blue blazes of the Hemlock Ledges Trail on the left. A little further up the road the trail turns right and heads for the state line. You will find survey markers along the trail as you approach the state line. 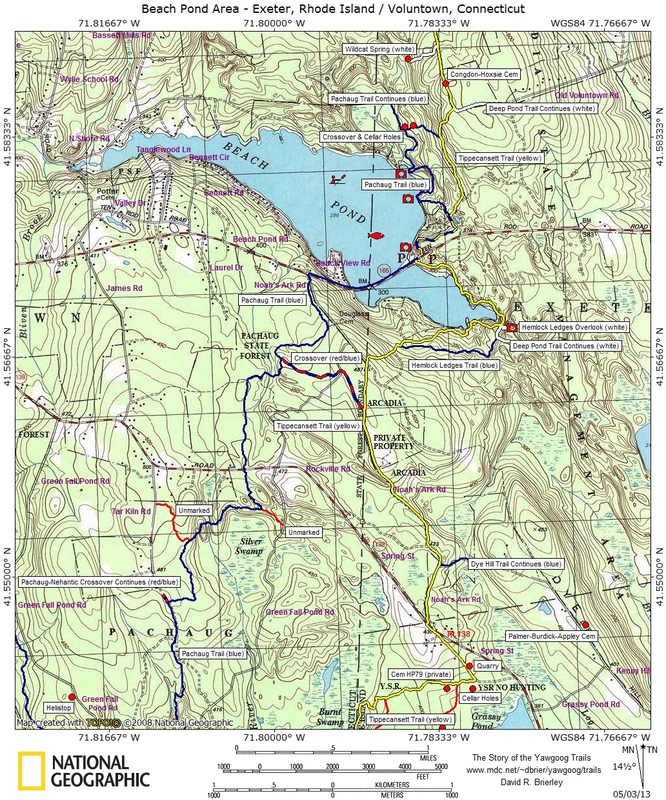 The trail then crosses Noah’s Arc Road and starts to follow an old road that straddles the state line for a bit before turning back into Rhode Island and the southwestern extremities of the Arcadia Management Area. The trail then comes to Route 138 at the Exeter/Hopkinton border. Following the yellow blazes still, the Tippecansett follows the busy highway for a couple hundred feet before turning off onto a dirt road across the street. The street has a few homes along it. At the time of this hike we were first “serenaded” by a pair of hounds, and then greeted by a black lab at the next house. The trail shortly thereafter makes an abrupt right onto Boy Scout property. The trail on the property winds quite a bit. Be sure to follow the yellow blazes and avoid making turns on unmarked trails. This area is also in abundance of mountain laurel and rhododendron and the trail at times is quite literally a tunnel through these magnificent shrubs. Soon the trail comes to a large table rock. The trail blazes are now at your feet along the rocks. A (darker) blue blaze trail now joins the yellow blazes of the Tippecansett. This is where the trail becomes quite strenuous in spots. From this point forward as well you will want to follow the yellow and blue blaze trail as there are some spurs that use the same color blazes. You will soon approach a rather impressive upward climb. Take your time and make the right steps. This one is easy in comparison to the next. After making the climb the yellow and blue blazed trail turns to the left. The trail to the right is part of the Narragansett Trail that leads towards Green Fall Pond. Follow the trail south toward the next climb, when you get to it take a good look at it first. If you are not comfortable with the climb there is an unmarked trail to the left that loops around Dinosaur Caves. After climbing up the trail you will then be up on the very large boulders that make up Dinosaur Caves. The trail then descends down the other face of the large boulders and continues south ending at Green Fall Road. This is the end of the Tippecansett Trail and where your second car should be parked. Trail maps can be found at: Tippecansett South 1 & Tippecansett South 2. Some Climbing Along The Tippecansett.